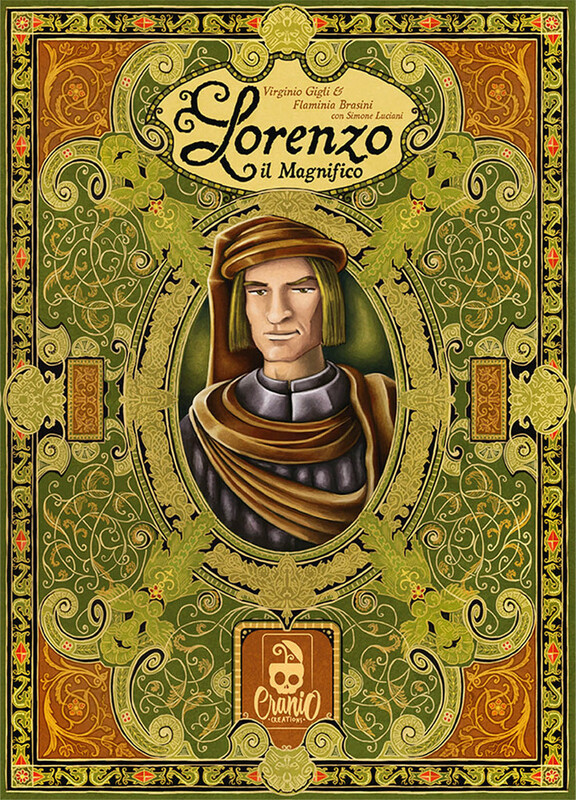 What is Lorenzo il Magnifico like? Lorenzo il Magnifico is at its hearth a very classic worker placement game, but with lots of unique twists. You will spend your turn placing one of your 4 different workers (known as family members in this game). While you can place them on most of the free places on the board, some require the family members to have a certain value or higher. This is where the dice come in. At the start of each of the game’s 6 rounds 3 differently coloured six-sided dice will be rolled. The result of these will dictate the value of all player’s family members. The 4th “uncoloured” family member is always considered to have a value of 0. Your family members will primarily be used to acquire new cards for your player boards, that represents your domain of stuff you own. There are 4 main type of cards: Territories, Buildings, Characters and Ventures. Each round will have 4 of these cards located in “towers” for each type, with various spots requiring different minimum value family members (1, 3, 5 and 7). So to take say the 3rd card from the bottom in a tower you would need to place a family member of value 5 or greater there. Now you might have noticed that it’s impossible to get the top pick in the tower since it requires at least a value of 7 and the maximum value of a family member is 6 (because of the six-sided dice). This is where servants come into the picture. Servants are of course there to help you out and can be acquired in various way in the game. Each servant you have can be spent to increase the value of your family member by 1 and multiple of them can be used to increase the value even more. This also becomes important for other spots that let you harvest and produce. Harvesting allows you to get resources from the territories you currently own, but once more, the value of the family members come into play. The more powerful a territory is the higher value family member is required to get the resources from it. A single family member will activate all your territories, so if you place a family member with a high enough value there (or use enough servants) then you will get to activate all of them and get lots of nice shiny resources. Production works very similar to this except here you activate your row of buildings. This will typically convert your resources into other resources or victory points. While gathering resources and gaining points will bring you closer to victory there is just one problem that you have to deal with in Lorenzo il Magnifico: The the faith track, and how it ties into the dreaded excommunication. Every other game turn players that have not gathered enough faith points will suffer the effects of excommunication by the church. These are always bad things that will affect and have a very big impact on the game. Lorenzo il Magnifico is a great worker placement game. Possible the best I’ve tried all year. It has a lot of things I love, and only a few minor things I dislike. It’s a game that rewards repeated plays and getting to know the set of cards, because they will all come up in each game (in a different order of course). It’s a game where one mistake can cost you very dearly. The engine building part of the game where you acquire cards and resources and activate your buildings and territories to get more resources and/or points really feels and plays great. This is how engine building works when it’s at its finest. The excommunication, while very punishing, is a great addition to the game. Will you spend your time gathering enough faith points to avoid the negative effects from them or will you live with it and focus on refining your rows of cards while living with downsides? If you like euro-style worker placement games and don’t mind things I noted, then what are you still doing here? Go out and buy the game, you won’t be sorry. The excommunication effects add so much variety to the game (and they are different each game). Interesting flow in the rounds based on the dice roll that affect the value of all player’s workers. A very good worker placement game with multiple nice new twists. It comes with added mini modules for advanced play. The component quality could be better. The game can be very punishing if (or when, if you are me) you make mistakes. It requires multiple plays and knowledge of the cards that will come out during the game to really shine. It does not work well with 2 players. While the basic rules of the game are not overly complicated, the gameplay itself is highly strategic and can be very punishing for new players. In addition to this the excommunication effects adds an extra layer of complexity to the game. I mostly agree with what Peter said. I do think that the replayability could suffer a bit from the cards always being the same. But then on the other hand it is such a deep strategic game that the randomness of more cards could very well ruin a lot of the strategy. It will surely be a pleasure to explore further. I won’t be selling my copy any time soon.